It’s time for a little balance. While in previous posts you’ve seen me bang on about the importance of character in driving your story, that’s – perhaps obviously – not the be all and end all of screenwriting. Writing great characters does not ensure your script will result in a hit film or TV series, or a sell-out theatrical masterpiece. There are quite a few more ingredients in the mix. Not the least of which being that a script in and of itself is only a blueprint and not the finished building. That may seem a random metaphor, but it’s not. Because just like a building, your story, in whatever medium, needs a solid structure if it’s to hold up to scrutiny. And boy can an audience scrutinise. They can be worse than the critics. So what exactly is story structure? In a broad sense, the structure of a story is the order in which its building blocks are presented to its audience, be the viewer, reader or listener. Narrowing that down a bit, those building blocks are the sequences, the scenes, the lines of dialogue and action that make up your script. In a television series, whole episodes can be such building blocks in and of themselves, all building towards a bigger story. The same can even be said for a movie franchise, from trilogies like The Lord of the Rings and Back to the Future, to the ever-sprawling Marvel Cinematic Universe. But that’s digressing a bit. It’s through those building blocks – and let’s grab the micro level for convenience’s sake, so through dialogue and action – that the script reveals the story’s setting, its characters and ultimately its plot. Over the years oodles of structural theories have been dreamt up to analyse narrative (story) structure, resulting in quite a few different methods of structuring your story. As is usual with theories, they all claim to be right and everybody else to be wrong to one degree or another. So, who is right, then? The frustrating answer is: all of them and none of them. At least, that’s my theory. Any theory that claims to describe (or worse prescribe) the only way something as fluid as story works is, to my mind, at the very least wrong in that absolutism. At worst, they’re nonsense, and at best, they are just one of many ways of looking at the same thing: story. And while that may be confusing, it’s also something that can come in very handy. 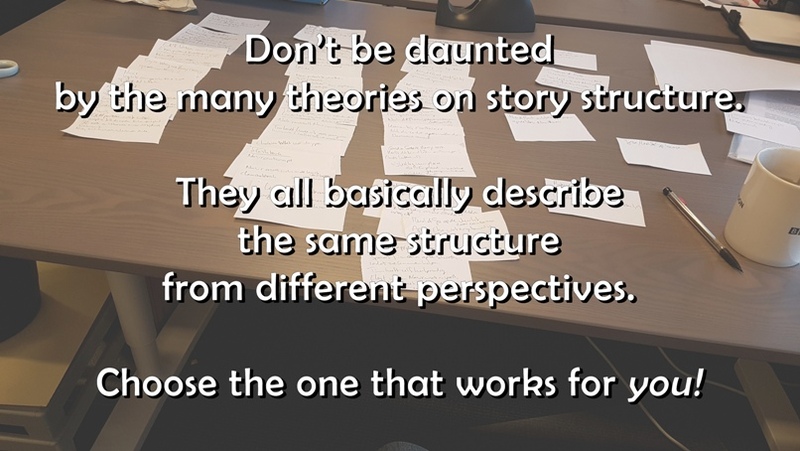 If you’re stuck in building your story according to one theory, perhaps another may, at least partly, provide a solution you hadn’t considered. Just like in a collaboration with a script editor, or director or producer, they can offer a fresh perspective on the story you’re trying to tell, which in turn can unlock things you hadn’t consciously considered about your story and/or its characters. It’s not like theories of dramatic structure are a modern thing, only coming into being since the rise of film and television. Theories about story structure have been around since Ancient Greece (and probably before) and most of the modern theories are in some way indebted to Aristotle’s Poetics. Which basically means that however much has changed about the media through which we tell stories, at their very core it’s all pretty much the same. In turn, that means that there is a tremendous overlap between all those different screenwriting theories and that most stories fit into more than one structural paradigm. For instance, a lot of Hollywood blockbusters fit Blake Snyder’s Save The Cat model (because that approach was written with those kinds of films in mind), as well as Syd Field’s 3-act structure, or Vogler’s Hero’s Journey (itself an adaptation of Joseph Campbell’s Monomyth), or John Truby’s 22 Steps (not to be confused with AA’s 12-step programme, however much writers are said to drink) or Gustav Freytag’s 5-act structure. Yeah, I just threw a shed load of theories at you, there, to totally confuse you. Don’t worry, I’ve been doing this for 18 years and they still all confuse the hell out of me at times. Luckily they all have books, so you can cheat and look it all up. If you’re having trouble seeing the screenwriting forest through the trees of theory, one book leaps to mind as a guide map: John Yorke’s Into The Woods. Handily, he studied all those structure theories and gives a handy overview of them. And my own approach to structure? I’m eclectic and take the pick-and-mix approach. I use Syd Field’s 3-act structure as a basis, but make sure to have some Save The Cat moments in there and along the road check how the story I’m working on (be it as writer or script editor) fits with Vogler, or Field, or… It depends on which genre I’m working in which structure I’ll prefer, but that’s for another blog. And also for a future blog: how structure works on more micro levels like dialogue, scenes and sequences. Read up on all of them, maybe using Yorke’s book as your primer, and find out which approach(es) to story best fits your style and story. After all, you’re the one writing this thing; may as well have those theories work for you, rather than against you.